One thing every body needs is delicious satisfying energy. 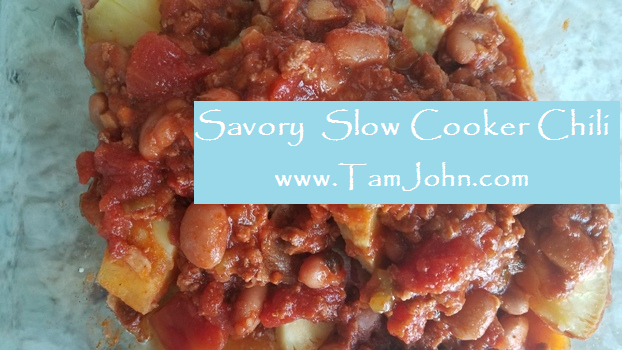 Consider the universal question ‘What’s for dinner?’ Savory Slow Cooker Chili is the answer. Tam John’s EatRight-LiveWell recipe has a secret. Read on for the secret revealed… and in just 10 minutes prep time this meal will welcome you home. Considering the universal question ‘what’s for dinner’ this recipe has a secret to make savory slow cooker chili even easier. With just a few ingredients and 10 minutes prep time, Savory Slow Cooker Chili will satisfy everyone at your table. Get the recipe with the secret from EatRight-LiveWell’s Principal Tam John, Integrative Wellness Leader and Stress Recovery Coach. The secret: This recipe doesn’t require messing up a skillet to brown the ground meat. You can even use frozen ground meat. You’ll get the same delicious and beautiful result. You could make a more sophisticated recipe but why would you? This recipe tastes amazing and has quality protein, veggies and more complex carbohydrates with healthy fat. This dish will deliciously fuel you and your family. 1 lb. grass fed ground beef. Or substitute ground chicken or turkey. 25 ounce jar organic tomato sauce without added sugar. Choose one with extra veggies like peppers and onions. 15 ounce can organic beans. Pinto, kidney, chili beans all work nicely. Here’s the secret to the secret: You can truly do this spur of the moment / even when your ground beef is frozen. Put the frozen beef in a slow cooker on low for an hour. Then stir to break it up. This step can work for you when you are getting ready for your day. Then come back and finish up in under 10 minutes. Stir the thawed beef to break it up evenly. Add the tomato sauce. Add a little water to the jar to get every last bit and create the desired consistency for your chili. Add 2-4 ounces of green chiles. Add Mexican seasoning. A teaspoon might be enough. You might want more. Gauge it by your taste and how you make tacos. When in doubt, add less. You can always add more seasoning to the finished dish. Rinse the beans in a colander and add to the chili mixture. Cook on low for 8 hours or high for 4 hours until simmering and cooked through. Wala! You walk in your kitchen after a big day to the tantalizing smell of beef and veggie chili filling your home. Your taste buds come alive! You feel welcomed home! Load your chili bowl to your delight with avocado cubes, grated cheese, a dollop of sour cream and salsa to make it your own. Delicious served on a baked sweet potato. Schedule your Free 15 with Tam John, Integrative Wellness Leader, on the phone. Interview her, discuss your wellness goals and where you feel stuck. Find out if Tam’s EatRiht-LiveWell approach is a fit for you.